1 of 3 In a 4- to 6-quart slow cooker, stir onion, celery, tomatoes, broth, chicken, kielbasa and cayenne together. Cover and cook on HIGH for 3 hours or LOW for 5 hours. 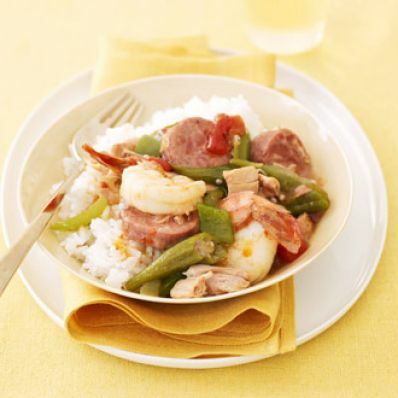 2 of 3 Stir in the green pepper, shrimp, okra and Cajun seasoning and cook for 1 hour or until shrimp is cooked through. 3 of 3 Remove 1/4 cup of liquid from the slow cooker and place in a small bowl; stir cornstarch into liquid. Stir back into bowl and cook an additional 15 minutes or until thickened. Stir in salt and hot sauce; serve with rice, if desired. Per Serving: 8 g carb., 6 g Fat, total, 94 mg chol., 2 g sat. fat, 2 g fiber, 425 mg sodium, 167 kcal cal., 19 g pro.